Yesterday, I watched the latest hindi flick, Peepli Live. The basic premise of the movie is on the ‘oh-so-serious issue,’ Farmers’ suicide! The story is set in a small village called Peepli, where a farmer on the brink of losing his small piece land thinks of taking away his life. How his family, the government, and the media react to this forms the rest of this story. Most of the reaction is comical, plain stupid, and irresponsible. The government officials fight over the ‘right’ scheme to fit this case under, the politicians look for political mileage, the family grieves and even throws its hands in despair, and the media just wring the issue completely to up their TRP ratings. And, all of this is captured in various ways; for example, the politicians make it out into a caste-based, election issue, the local government official spurs into action and brings a hand pump, the media frenzy outside the poor farmer’s house creates a carnival-like situation, etc. And, finally, the inevitable happens, and everything simply quietens down. It’s basically back to business, with no money or livelihood in sight for the farmer's family, except that the area now is filled with trash, thanks to media-generated carnival. As I walked out of the movie hall, several questions kept whizzing past. Now, why is a movie made? Or, why do people go to movies? And, what is actually funny? Apparently, the movie is written and directed by some Anusha Rizvi, who’s a debuntante director. I wonder if the director even for a moment paid any attention to what this farmer’s suicides are all about! Clearly, in some ways, the director did know what she was talking about. The first few shots dealt rather well about the grim reality of farmers in this country. But, one was just not prepared to see the goriness of the director’s imagination/gall to poke fun at this! It’s a different thing when you capture the ethos of the village life and see an occasional laughter even amidst grinding poverty, but what Peepli Live did to the village/the issue was much beyond any limits of human insensitivity! In this lecture, P. Sainath wonders, “What sort of sensibility did it require to pop another fig into your mouth as one more human being went up in flames nearby to serve as 'a nightly illumination?” I have just this one thing to tell him, the sensibility that had all the women, men, and children (yesterday at the movie theater in Chennai) cracking up as a human being and his family was completely stripped of their agency/dignity to decide, think, or even to live. Yesterday, as I walked out of the movie hall, it was with Nero’s guests I walked out. It was quite a weird and a holocausty feeling to be amidst them and to have seen a film made by one of them; the Nero’s guests! I haven't see the film.... But I read somewhere that it's supposed to be a black comedy. Does this information alter your views? Nope, it doesn't. Since black comedy definitely retains the seriousness of the issue in question, which was not the case here. You mirror exactly my thoughts on the film. It just doesn't get into the much tougher task of sensitizing people to the plights of a fellow human, or a fellow community (do we consider rural spaces as common to ours now, except in an idealized, reductionist and exoticised fashion). It does present what people already know--that the media will make use of whatever it can project as sensational, that politicians will follow the media (vice versa), that the world is opportunitistic and greedy and it is all about money and power now, and it is each for oneself now etc... Well, it is a movie made by the middle class, for the middle class. Even if you replace farmers suicide with say, retrenchment issues, health issues, mining, flesh trade etc etc.... it still stays the same. The movie makes good use of the tropes middle classes identify with, the things that create the middle class spaces--Indian Ocean, media, English speaking and 'brash' Hindi speaking journalists, 'poor' and 'stupid' villagers etc. etc. The one scene where the film redeems itself--where HORi the farmer dies-- I wonder how many people actually got that--HORI was the name of the protagonist of Premchands's famous rural novel 'Godaan'. I am actually not surprised by people laughing. You laugh when you are not the same side. We are not on the receiving end of this great elimination, Hannah. The moment we realise we are all in teh same boat, nobody will laugh. Peepli Live absolutely lacks sensitivity. It showcases human beings as laughing stocks for the amusement of multiplex audiences, who laugh at the poor plight of the people grappling with their lives to pull on. Come on, we all know what a dark comedy is. This movie isn't! It is just yet another movie that humiliates the marginalized people. It is completely a reductionist view of the urban and upper middle class people. The movie has also terribly failed in the way it has handled the relationship within the members of the farmer's family. It is full of stereotytpes and generalizations and is completely seen through the lens of elitist society. Making caricatures out of the lives of those people, for the multiplex and international audience to laugh at! The movie is just a false alarm! I saw the movie, not in a multiplex, but at home. Since I did not get distracted by the cackles of people around me, I focussed well on the nuances of the characters and generally, the film. I would give it to Aamir. He has certainly chosen a difficult subject, but yes, he could have handled it better. That said, Peepli Live is not insensitive. The film attempts to drive home the point of media-insensitivity and TRP-hungry media barons. I like the concept because it disturbs you. Once you are done laughing at "Nattha" and his borther, the message hits you, smack, on your face. The cruelty of the politicians, the cruelty of people who simply want to up their TRPs. Like Page 3, PL is an eye-opener, delivered with humor to drive home the idea, deep, into the psyche of the common man. 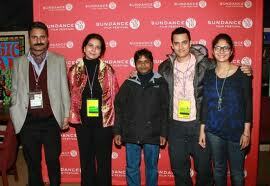 Again, it also demands a certain audience, to understand the masterstroke, by Aamir. If you could delve slightly deeper, below the smokescreen of the humor and the chaste hindi "gaalis," you will find the message. A farmer kills himself to feed his family. The reason is the deterioration of the system and the corruption rampant at all levels.